We’d love your help. 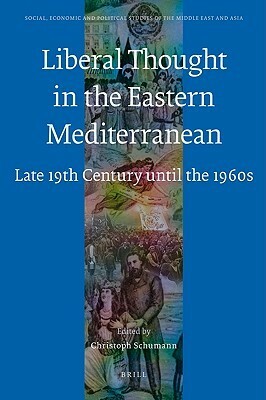 Let us know what’s wrong with this preview of Liberal Thought in the Eastern Mediterranean by Christoph Schumann. To ask other readers questions about Liberal Thought in the Eastern Mediterranean, please sign up. Excellent essays on "liberalist" shenanigans in the Levant mostly during the first three decades of the 20th century. Strong sections are the Sluglett and Provence pieces on the French Mandates, Rafeq's essay about the Syrian University, Khuri-Makdisi's essay on radical socialist groups in Beirut just prior to World War I, and the essays on the pre- and post-war Ottoman political hijinks. The entire third section is less interesting and/or useful ("ventriloquized memoirs"? ).